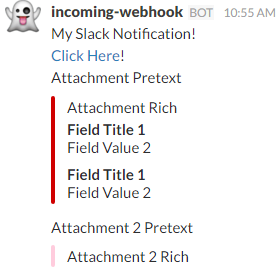 In this article you will learn how to create a Slack webhook integration and send a notification to it. This article assumes that you already have a Slack team setup. Follow the instructions for setting up an incoming webhook integration. When finished, you should have a Webhook URL that looks like "https://hooks.slack.com/services/some/random/text". Text = "My Slack Notification!\n<https://google.com|Click Here>!" Title = "Field Title 1"
Fallback = "Attachment 2 Plain"
Text = "Attachment 2 Rich"
Pretext = "Attachment 2 Pretext"